The next time your family clamors for Chinese takeout, serve up this Chinese spare ribs recipe. It's made with a hoisin sauce that mimics what you would get from your favorite takeout restaurant, but it's much friendlier on the budget. When serving ribs, you generally allot about half a rack — or about 2 pounds — per adult. For Chinese-style spare ribs, you can divide it up the same way for an entree or reserve fewer ribs per person if you're serving them as an appetizer. Cut the spare ribs apart into individual ribs, and place them in a shallow glass baking dish. In a medium-sized bowl, combine the soy sauce, hoisin sauce, ketchup, rice wine or sherry, brown sugar, and chopped garlic. Pour the mixture over the spareribs. Cover and marinate overnight in the refrigerator, turning occasionally to make sure the ribs are thoroughly coated. Bring the water to a boil, and dissolve the honey. Fill a shallow roasting pan with 1/2-inch of water and place in the bottom of the oven. Place the pork on a rack above the water. Roast the pork for 30 minutes, or until the ribs just begin shrinking and the internal temperature reaches 160 degrees F (71 degrees C). 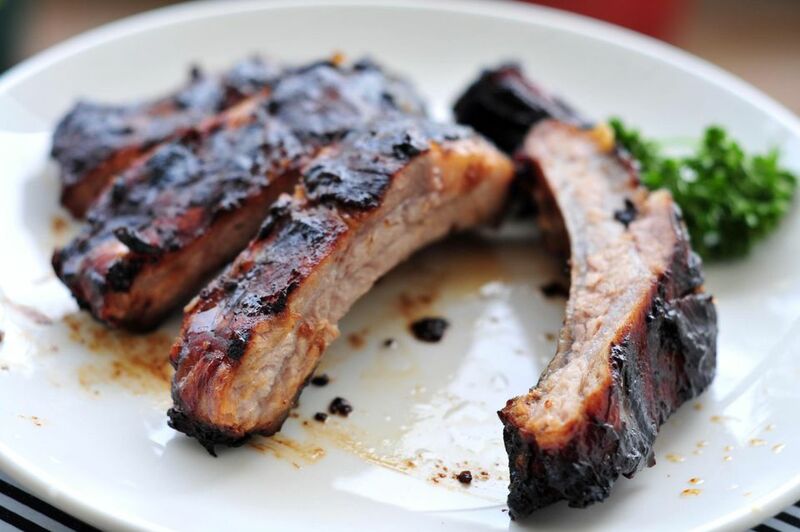 Brush the spareribs several times with the honey and water mixture during roasting. Remove, let the ribs rest for 15 minutes, and serve. Spareribs can be cooked ahead of time and refrigerated or frozen. Thaw the frozen pork in the refrigerator or microwave. Use refrigerated pork within 4 days. Reheat ​the frozen or refrigerated pork before serving. Cutting the slabs into individual ribs allows them to cook faster and more evenly. If you want to cook the whole slab, do the low-and-slow method: around 250 degrees F for 2 1/2 to 33 hours. If you want a deep red hue to the ribs, like you might get from the Chinese restaurant, add a few drops of red food coloring to the sauce. Grilled Chinese spare ribs: After marinating overnight, take the ribs out of the fridge and bring them to room temperature. Heat a charcoal or gas grill to 275 degrees F. Place the ribs on a wire rack, and place the rack on the cooler side of the grill. Cook for 2 to 3 hours, basting occasionally. Drizzle the ribs with the honey money and cook them on the grill over direct heat until they're quickly charred. Smoky barbecue spare ribs: Replace the sauce ingredients (hoisin, soy sauce, ketchup, rice wine, sugar, and garlic) with 1/2 cup Dijon mustard, 1 1/2 cups of your favorite spice rub, 1/2 cup brown sugar, and 1 1/3 tablespoons liquid smoke. Brush the ribs with barbecue sauce (about 2 cups' worth) throughout cooking.